A friend of mine here in Atlanta is pregnant, due next month. As is my typical approach to gifts, I wanted to get her something special and meaningful. 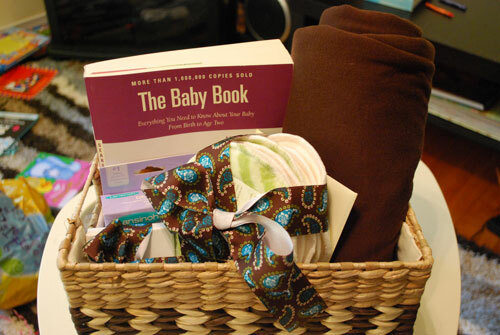 I knew she was planning to breastfeed, and since it is a topic very close to my heart, I thought a gift of things to make that journey easier for her would be special for both of us. I had a lot of fun putting it together! I was going to just get the Lansinoh disposable nursing pads, since those are what I used, but a friend of mine makes them and offered me a good deal on 4 pairs. Two were made with minkee and are soooo soft. I hope she likes them! I’m sure you can find reusable nursing pads without too much trouble anywhere that sells cloth baby/mama related things (cloth diaper retailers, Etsy, etc). This is a must-have for any breastfeeding mother! I used this stuff like crazy when Savannah was a newborn. I put the question of what to buy for the basket on one of my forums, and one of the moms suggested these. I had never heard of them, but when I saw them in the store I thought they sounded brilliant. Perhaps it was because Savannah was a summer baby, but I would have loved the cool relief of a little gel pack. I added these to my basket, and I hope they are as useful as they seem they would be! I found these at Babies R Us made by Lansinoh, but I think there are other brands that make them too. Nursing necklaces are for the baby to play with while he’s nursing, to distract him from playing with Mama’s hair or her shirt or her other breast… I was going to buy from Etsy but I actually ended up making it, and it was very easy. 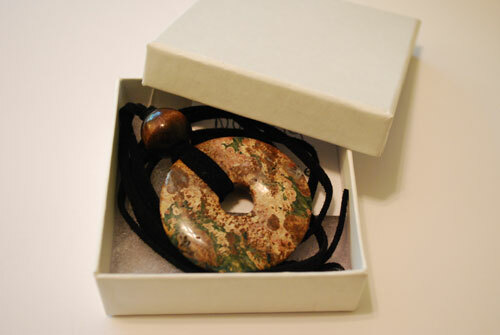 I happened to find a local bead store going out of business, so I picked up the doughnut stone for a very good price. I just used a leather suede cord and knotted it around the stone, and added a wooden bead for decoration, and I was done! I made it extra long so my friend can choose to cut it to the ideal length. There is a picture later in the post. I had a lot of other ideas for items that I didn’t end up including for various reasons (cost, etc. ), but I’ll list them here in case you’re looking for something else for your basket. I designed and printed it on cardstock. It has the name and number of a friend of mine who’s an LC, the website address for a local breastfeeding online support group, La Leche League’s local hotline, the website for our nearest LLL group, and links to kellymom.com and infantrisk.com. Quick reference for those middle of the night stress times! One last thing… In the card, I included a letter that I wrote to her. I shared briefly my breastfeeding story (I had a really rough start), and talked about how my struggle led me to doubt my own abilities to mother, and how the encouragement of friends was the only thing that got me through it. I wrote how she could always call me if she had any trouble and that I would be happy to help or just be a listening ear. I also included the different local breastfeeding support groups and numbers she could call – basically everything on my quick reference card, with more detail and explanations of what these numbers/websites were actually for. I really wish I’d had this available to me when I was a new mom and overwhelmed with EVERYTHING (I’d also bought a house, so maybe that added to the stress?). The thought of trying to find an LC was just too much at the time, though I really do regret not seeing one sooner. (I ended up going to one when Savannah was 8 months old and I had that breast abscess – but that’s a whole ‘nother story!) I think just making those numbers available to her will make a huge difference. I hope she likes it and finds it useful! I really had a lot of fun putting it together! I love this idea! Some great options for the basket :-). I think the quick reference card is especially a great idea. It was a great gift, Ashley! I’m sure she will make good use of everything! Wonderful idea! I love these types of all-inclusive gifts, and for a new mama this is excellent. The nursing necklace is beautiful! I have the The Womanly Art of Breastfeeding, and it’s been my go-to book for information. I had a couple other breastfeeding books, but decided they were redundant and not as good so I consigned them. Another option that might be cheaper than buying a carrier could be a nursing cover, if you know the mama might go that route. Some websites have special deals where you can get one for free and just pay shipping. I had some washable nursing pads and LOVED them – great choice. Oh right! Nursing cover! I meant to add that to my “other ideas” list! I’ll update the original post. :-) Thanks! I wouldn’t even attempt bf without soothies and lanolin. This is overall a great idea. I love that you included a Moby instead of a nursing cover. I’d hesitate to give a nursing cover as a baby shower gift, because I wouldn’t want to communicate “This breastfeeding journey you’re embarking on is important- but not worthy of being seen in public.” The Moby communicates that the baby is able to be taken into public, anywhere you can go too- no stroller, baby bucket, or babysitter necessary! That was exactly my thought process, Joanna. Not that a nursing cover is bad, but I wanted to be very careful not to give the wrong impression! What a wonderful, thoughtful gift! Ashley you are such a sweet friend and I know that this new mama will feel so blessed by you. I know you have mostly been working on the marketing side of the birthing center, but have you considered having the center provide something similar for families? I don’t know if that’s financially feasible but it would be a really nice touch.